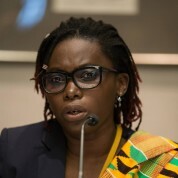 A regular speaker of Women of the World (WOW) at the South Bank in London, recently named as one of the 100 most influential Africans by the Africa Business Magazine, and Forbes Magazine, Mariéme Jamme is a Senegalese born-British businesswoman, who ran a technology consultancy business in London. Her company Spotone Global Solutions helps International tech companies selling enterprise software solutions, to set a foothold in Africa, Middle East and Asia. Marieme is best known for her role in promoting technology, good governance, transparency and a better education standard in Africa. Mariéme grow up in rural Senegal, from an oligarch mother who gave her away at early age and later was raised in an orphanage and then trafficked for sexual exploitation in France. She experienced considerable hardship during her childhood and did not attend school and gain formal education until the age of16 years old. She is a blogger, technologist and education activist who work tirelessly to empower her fellow Africans through capacity building, education, empowerment, mentoring, leadership and economic development. Mariéme was also named one of Forbe’s ’20 youngest power women in Africa 2012′, nominated by the guardian African community network as one of the African women to watch in 2013 and recently honored as a Young Global Leader by the World Economic Forum in Davos. Mariéme has founded many ventures aiming to support the development of Africans such as the “Cheetah Accelerator” (An Investment Fund and Business Accelerator), and founded of Africa Gathering, a platform bringing entrepreneurs and others together to share ideas for positive change around the world. She was recently voted one of Africa’s top 25 women achievers by The Guardian Newspaper in the UK”. Mariéme has recently supported many organizations such as Google, Ernest and Young, HSBC Bank PLC, UK government, Appfrica International Inc. and the Obama Administration in the USA for 3 years in organizing the Apps4Africa tech competitions across Africa and the Africa Progress Panel chair by Kofi Annan to host brainstorming events on the state of the Extractives of Africa and Agriculture in many countries by bringing the Report to the grassroots. Having fought hard as a young girl in Africa for an education that was denied to her; women’s education, empowerment and freedom is paramount in Mariéme ‘s life, hence the creation of the Mwasi Tech Hub in Kinshasa and JJiguene Tech Hub in Senegal: the first women Tech Innovation Networks supporting young women in Science, Technology, Engineering and Math’s (STEM). Mariéme has recently joined the Nigerian Billionaire Tony Elumelu as a select committee member and adviser for his $100M Entrepreneurship Program and the Microsoft 4Afrika as an Advisory council member advising on how to engage the youth in Africa’s development and increase their competitiveness in the global market by creating profitable SME’s. Mariéme is a regular technology writer, judge, advisor in many global tech competitions, and a contributor for the Guardian, Huffington Post, the BBC, the Africa Report and CNN. A Highly demanded speaker for her straight and passionate way of engaging an audience, Ms. Jamme recent Keynotes include the World Pension Summit in Abuja, World Affairs Council in San Francisco and with Legatum Institute in Tanzania about Women in Technology in Africa, Big Data, Entrepreneurship and Investment Marieme is also the recipient of the women Empowerment Award at Rebranding Africa Forum alongside Donald Kaberuka, Former President of the African Development Bank.